Epson EH-TW7400 review | What Hi-Fi? Epson may have declared its latest projector a 4K supporter with its ‘PRO-UHD’ labelling, but on the spectrum between ‘definitely 4K’ and ‘definitely not 4K’, the EH-TW7400 is actually somewhere in the middle. It can play 4K (and HDR) material, and features its own ‘4K-enhancement’ technology, which promises to convey the superior resolution. But typically of 4K-supporting projectors at this price, it only has 1920 x 1080 (Full HD) resolution chip architecture, as opposed to the native 4K silicon found in pricier models such as the £5000 Sony VPL-VW270ES. So while you shouldn’t expect the ultimate 4K projection from Epson’s newest beamer, you can at least hook it up to a 4K Blu-ray player and play Ultra HD Blu-ray discs. Once the 11kg Epson is hoisted onto our AV rack and connected to the Cambridge Audio CXUHD 4K Blu-ray player via one of the Epson’s two HDMI inputs (which allows 4K passthrough thanks to its HDCP 2.2 certification), set-up is straightforward, thanks to its motorised optics. This allows us to fit the picture onto the screen simply by using the 2.1x zoom, focus and lens shift keys on the remote control. The remote is a handy gateway to adjusting picture settings. Using a THX Optimizer disc will help guide you to the optimal brightness, contrast and colour tone and temperature for your preference and environment. You’ll get the best contrast (and overall picture) in a dark or dimly-lit room, but the LCD projector’s claimed 200,000:1 contrast ratio and above-average 2,400-lumen brightness output means that it’s capable of producing a coherent picture with some light present too. While ‘Cinema’ is our generally preferred picture mode, this is when ‘Dynamic’ or ‘Bright Cinema’ modes can step in. So, 15 minutes after opening the box, we settle down with Star Wars: The Last Jedi on Ultra HD Blu-ray, eager to see whether the Epson makes good on its 4K pledge. The Canto Bight casino city scene is an obvious go-to for its splashy cinematography and night-time setting, and the Epson plays its cards right here. The scene is made even more appealing by its crisp, sharp and richly-coloured delivery. The Epson highlights the gleam on the casino floor, the sparkle of the dresses and jewellery to the glistening casino tables and slot machines. Not only does it boast the dark depth to make the tuxedos look slick and expensive, but it also has the insight to distinguish their outlines so that you aren’t just looking at a black blob. There’s an almost effortless intelligibility to the Epson’s picture thanks to its stark clarity and brightness, and those traits don’t suffer in more dimly-lit scenes either. When Finn and Rose head out on the balcony, lamp lights punch out against the night sky with definition and little blooming around them. We switch to our Product of the Year projector, the Optoma UHD40 (£1000), and the Epson justifies its almost double price tag with a quality of picture that leaves its rival in the dust. While the UHD40 does a fine job highlighting HDR’s potential, the Epson’s colour reproduction is equally adept with the more intricate shading as it is with brightness and colour punch. There’s dynamism and richness in spades, but the palette opts for refinement over ritz – and is all the better for it . The Epson is the more insightful watch when it comes to dark scenes, too, exposing more detail on the island rock face and in the sunset-lit cave. While the Epson does 4K Blu-ray justice with its 4K enhancement technology and HDR playback, it still can’t match a native 4K projector. Sony’s VPL-VW270ES, for example, costs over £3000 more, but justifies the extra spend in large part thanks to its full-fat 4K credentials. It is a huge leap ahead in colour richness, crispness and overall transparency, too. But when playing Blu-rays or other Full HD material, the Epson's 1920 x 1080 resolution means no scaling is necessary and the projector is much more at home. Clearly there's a downgrade involved when going from 4K to Full HD, and when we switch to Star Wars in 1080p there's a degree of glossing over skin-tones rather than surfacing their variations and blemishes, and colours are a little less nuanced and more artificial while also comparatively lacking punch and vibrancy. But that's largely to be expected of the drop in quality of the source material, and just goes to the prove the worth of the Epson’s 4K enhancement tech. Besides, with Full HD the Epson very much holds its own. The picture still pops from our projector screen – it’s bright, clear and detailed, solidly coloured and convincingly stable. Go even lower in terms of resolution and it’s something of a revelation how watchable DVDs are through a projector of this price. The below-4K performance of the Epson isn’t too dissimilar to that of the Sony, which perhaps isn’t too surprising when you consider that its Full HD chip is having to do markedly less processing than the Sony’s native 4K chips. 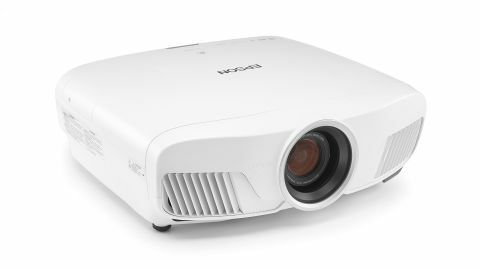 Like many Epson projectors, the EH-TW7400 excels for its price. Native 4K projection costing under £2000 may one day be common, but for now, 4K workarounds are perfectly good middle-ground solutions. If you’re about to buy a projector, and hankering after something bigger than a telly but cheaper than a native 4K projector, this Epson is the perfect compromise to get the super-sized 4K experience.